Leica has released a limited edition model of its M10-P digital rangefinder to celebrate the 100th anniversary of the American Society of Cinematographers. In February 2019, the ASC will be presenting its awards for the 33rd time which Leica says is 'an ideal occasion to present an exclusive tool for filmmakers: the Leica M10-P ASC 100 Edition. Leica has been linked to the world of cinematography since its very early days when Oskar Barnack took 35mm motion picture film strips to use them in still cameras. He also used the original Leica camera to test exposure settings for cinema cameras with a still camera. The limited edition set comes with a Leica M10-P body and a Summicron-M 35 f/2 ASPH lens. The camera includes two cinema-look software modes which have been developed in collaboration with 'some of the world’s most influential cinematographers and members of the ASC. ' The ASC Cine Classic mode simulates the analog 35 mm motion-picture film look while the ASC Contemporary mode creates a contemporary digital movie look. In addition the M10-P ASC 100 Edition lets users select from different aspect ratios used in cinematography. Aspect ratios are visible as a bright-line frame in Live View mode. With the camera and lens buyers of the set receive a Visoflex electronic viewfinder and a Leica M-PL-Mount which allows for the use for most PL mount cine lenses with the camera. This means cinematographers can view and test scenes with a cine lens before motion picture shooting begins. As one would expect, the limited edition camera also features a unique design, with black engravings on black chrome surfaces and leathering which is similar to the Leica SL. With its gold-colored anodized finish the design of the lens was inspired by the 'Ur-Leica' brass look. 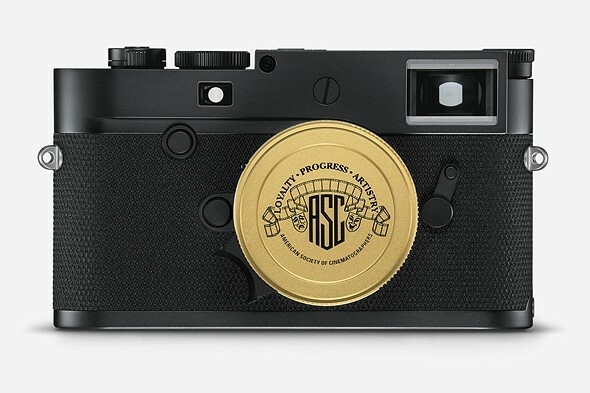 The final touch is the ASC logo on the top plate. The Leica M10-P 'ASC 100 Edition' will be available beginning autumn 2019. No pricing information has been released yet but expect it to be expensive. More information is available on the Leica website.